The CFIA announced an allergy alert and a product recall against specific brands of kimchi products for having undeclared allergens. The products, sold under the Nonghyup Suncheon and Nonghyup Arumchan brands, are said to contain the allergens shrimp and fish. The affected products do not indicate the presence of the allergens on its packaging. This might cause harm to consumers who have a sensitivity to either fish or shrimp in any form. As food allergens, shrimp and fish can trigger allergy attacks to people allergic to them. In some cases, these allergy attacks can worsen to even serious medical emergencies. For people who do not have allergies to either or both fish and shrimp, the products are safe to eat. To date however, there have been no reports of illnesses that are connected to the recalled products. 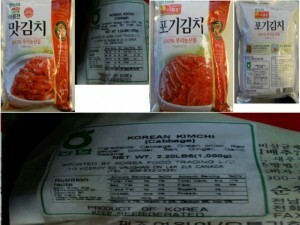 These kimchi products were distributed to various retail stores inOntario. The products’ importer, Korea Food Trading, is already working on recalling all of the affected products while the CFIA is monitoring the recall. For consumers who want more information about this recall and allergy alert, may call the CFIA at its hotline 1-800-442-2342 or 1-800-465-7735. The hotlines are open from Monday-Friday, 8 AM to 8 PM.